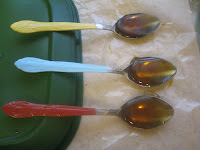 Week # 4 of my Thrifty Gift Fridays feature these Honey-Lemon Spoons. You may have all made those chocolate dipped spoons to go with hot cocoa for a cute gift years ago. 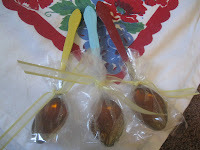 These honey-lemon spoons are a nice twist on that same idea.This recipe makes a honey-lemon toffee that hardens onto the spoons. 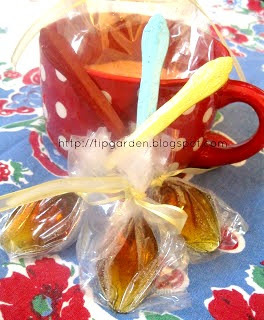 You can then use them to stir into a hot mug of tea, and the honey-lemon toffee melts into the tea as you stir. You can use plastic spoons (there are some realistic looking silver ones out there), but there are concerns about the plastic releasing cancer causing agents when heated, so take that into consideration. I chose to buy inexpensive real spoons from the dollar store (4 for $1.00), but mismatched ones from a thrift store are cute too! Jan's tip: BONUS IDEA: See bottom of post for another way to use this recipe other than spoons! Using painters tape, I taped off the first 1/2 inch or so of the spoon handle (you can choose any spot). 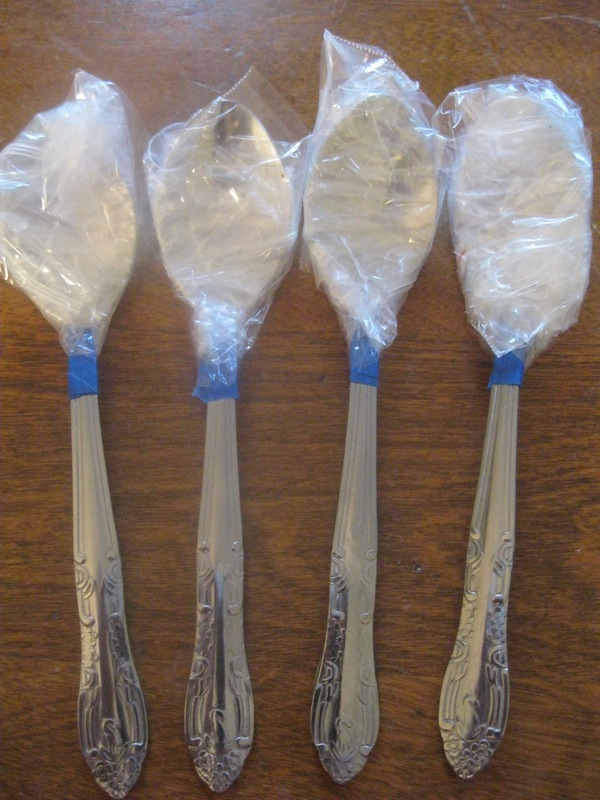 I then wrapped the bowl of the spoons in plastic to avoid my inevitable mess ups, so only the parts I wanted painted were uncovered. I got busy and forgot to take photos of the painted spoons. I used spray paints that I already had at home, but you can dip them in enamel craft paints as well. Mine took 2 coats. Once dry, unwrap the tape and plastic from the spoons and they are ready to dip. Pie Plate or Lid that you can use to rest the handles of the spoons on (this will lift the bowl of the spoon and keep the liquid toffee from spilling out while it hardens). Line a cookie sheet or work surface with wax paper. You will need to find something that the handles of your spoons can rest on while the toffee cools. 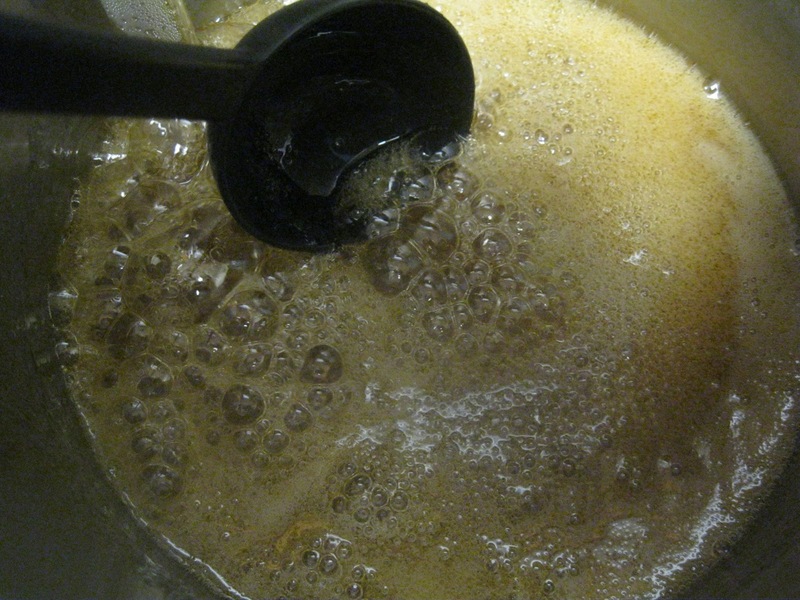 Lifting the handles slightly will keep the toffee from spilling out of the spoons. Place the selected item in the center of the waxed paper. Items might be a lid to a container, pie plate, etc. 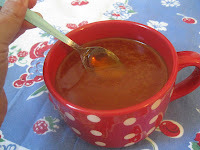 Test this by filling a spoon with water or honey and laying the handle on different items at different heights till you get the test liquid to stay in the spoon. I used a plastic lid from a plastic food storage container. Mix honey, sugar, and vinegar in saucepan, and bring to a boil, stirring constantly. 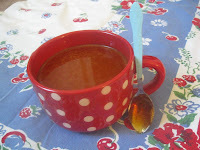 To test for hard crack stage without a thermometer: Drop a small drop of the toffee into a glass of ice cold water. 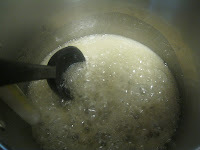 Remove saucepan from heat and let cool for a minute or so. 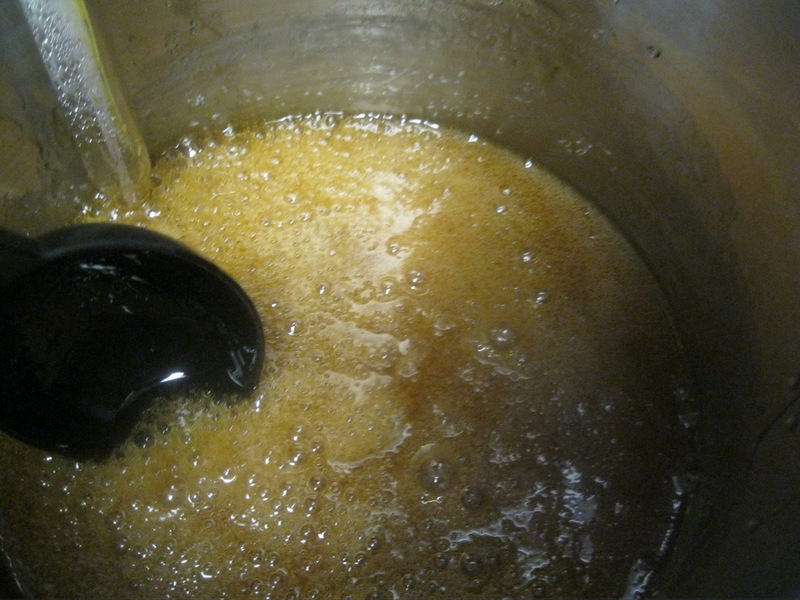 Jan's tip: The candy hardens as it cools so you have a few minutes to work, but not a ton or time. So this is why I had you set up the waxpaper work surface for your spoons at the beginning. 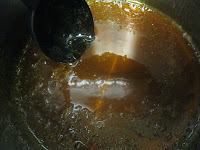 Dip your spoons in the toffee. 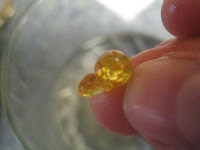 I filled mine almost all the way to the brim, and had a few overflows, so play with it just a bit on the first one. Once it has cooled and hardened, wrap the spoons in plastic (I cut down small cellophane treat bags to fit) and tie with a ribbon. Since I was making this really, just for the post, I only had about a dozen spoons to fill. I had more toffee than spoons. I quickly sprayed a small rectangular baking dish with non-stick spray and poured the remaining toffee into the pan. It was pliable, but no longer a liquid.Before it hardened completely, I used a pizza cutter to cut through the soft (yet hardening quickly) toffee and scored it into pieces. I let it cool in the pan, and then broke apart at the score lines. I now have my own Honey-Lemon Lozenges. 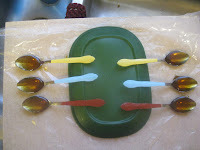 I did this on the fly, and didn't photograph it so I think I"ll do it again and possible go buy a small silicone mold for candies and make this again, so I can post it as a home remedy recipe for sore throat lozenges, but in the mean time this gives you a second idea to think about! These look beautiful! Can't have too many good gift ideas this time of year. I'd love to, I am battening down the hatches for Hurricane Sandy the next few days, but I'll try to pop over after that, thanks! 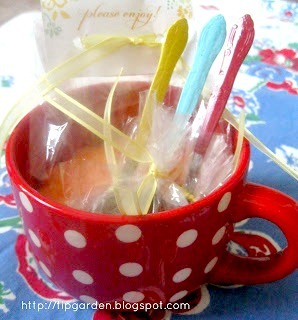 love this idea and think it will make a nice addition to a tea basket. Thanks so much Lisa! I am super excited! I'll be linking up for sure! Thanks so much for featuring me this week! I am so excited! I will grab a button! Love A Pinch of Joy! do you have to have the heavy bottom pan? sounds great and would like to try but do not have that kind of pan...Thanks! could you make these without lemon? Thanks! Will be using for an event! Thanks for the great idea! Let me know how it goes! Best of luck!